I his noisy, restless bird is nomadic, and flocks will gather at any good source of nectar. Originally a bird of coastal heathland, it also visits gardens and parks. It feeds on insects. • NliST A cup nest of grass and bark, bound with spider-webs, with a softer lining, placed in a bush or tree. 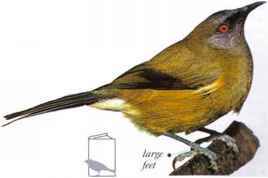 The liquid, bell-like song of the New Zealand Bellbird is heard throughout the year. 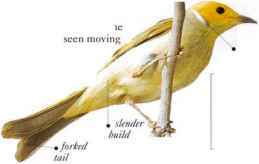 It is a common forest bird, often seen in large numbers on (lowering trees, where it feeds on nectar, fruits, and insects. It also visits gardens near the forest edge where fruit is offered. • NliST A loosely constructed cup nest made of coarse materials, lined with fine grasses and feathers, and placed in the fork of a tree. 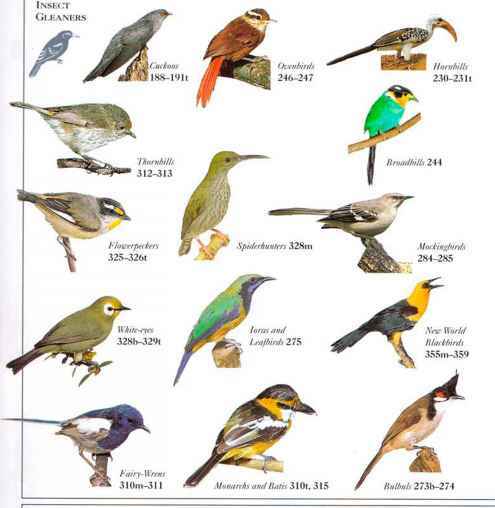 • RliMARK Only three species of distribution honcveater occur in New Zealand. Although conspicuous because of its large si/.e and colorful appearance, this honeyeater is rather quiet and unobtrusive. Sluggish in general behavior, it occurs in the upper branches of the higher mountain rain forests, usually singly or in pairs, feeding on fruit such as berries, with occasional insects. Presumably because of this diet it has a short, heavy bill and lacks the brush tongue ol nectar-feeding species. The typical call is "chut, chut." The yellow face wattle-appears capable of becoming red during sexual displays. Because of its isolated range and retiring habits in a difficult habitat for field work, little is known about it. • NEST A bulky, cup-shaped nest, loosely made out of moss, leaves, and other plant material, hanging from the end of a branch. W. New Guinea, from 3,900 ft (1,200 m) to 11,000 ft (3.300 m). 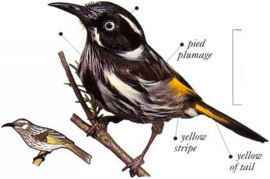 I his heavily built, generally gray-brown honeyeater is a sociable and attractive bird, with a strong, yellow colored wash on its breast and forehead. It lives in small colonics, often in scattered groups of trees in otherwise open country. Birds probably travel nomadically between such Ice-ding and roosting sites. They feed predominantly on the ground, taking insects and seeds, but they also ascend the trees to take berries, fruit, and sometimes nectar from flowers. 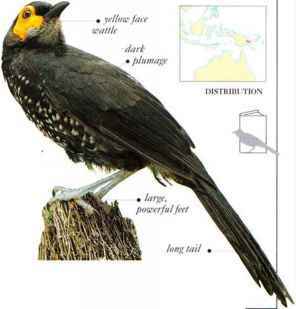 Yellow-throated Miners are aggressive birds, with much quarreling within the colony as well as vigorous defense against birds of other species. Often this defensive behavior involves the entire flock, taking wing and chasing a marauding bird of prey out of its territory, mobbing, and even physically attacking the intruder in flight. There-is cooperative care of nestlings within the colony. • Nest a loose cup nest made of grass and twigs, lined with wool and feathers, and placed in a tree fork up to 20 ft (6 in) from the ground. • Distribution Much of Australia.